When the weather is hot and I’m feeling lazy, I like to focus as little attention as possible on spending time in the kitchen. 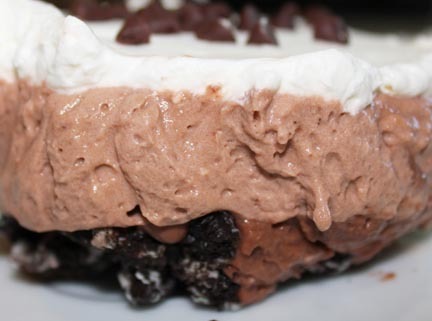 My latest version involves chocolate, chocolate and more chocolate! 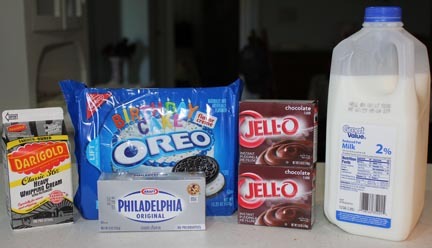 Ingredients … and out of the 396 packages of Oreos at the store, of course I grab the one with birthday sprinkles in the filling! Start by crushing the cookies into small, obliterated chunks. You can do this in the food processor, with a meat tenderizer, or have your husband beat them to death. Captain Cavedweller happened to wander into the kitchen at just the right time and got put into service as the cookie pounder. 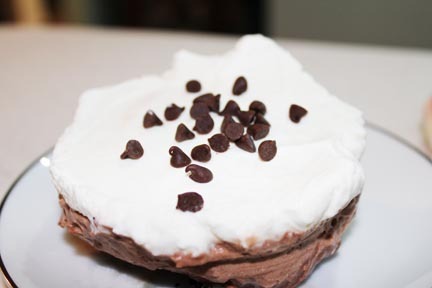 While the cookies are being pulverized, whip the cream until thick and luscious. I added about a half-cup of powdered sugar, to give it a little sweetness. Just stir in gently once the whipping cream is thoroughly whipped. Spread the cookies into the bottom of a 9×13 pan and press down. Beat the cream cheese until smooth and creamy. Then add in pudding and milk, blending well. 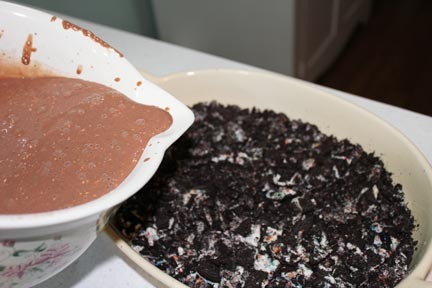 Pour half the mixture over the top of the cookie crumbs. Work with some sense of urgency at this point because it won’t take long for the pudding to begin to set. 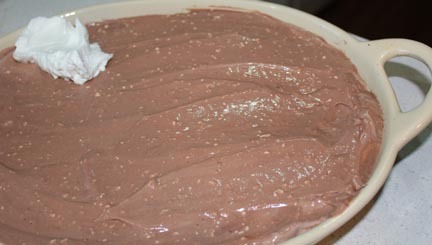 Fold half the whipping cream into the remainder of the pudding mixture. Spoon on top of pudding mixture already in the pan, then top with remaining whipping cream. 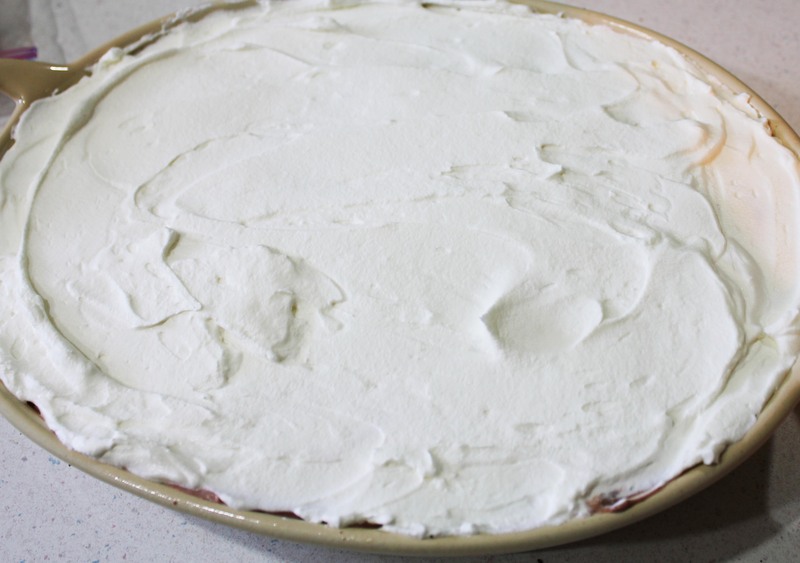 Spread whipping cream evenly over the top. 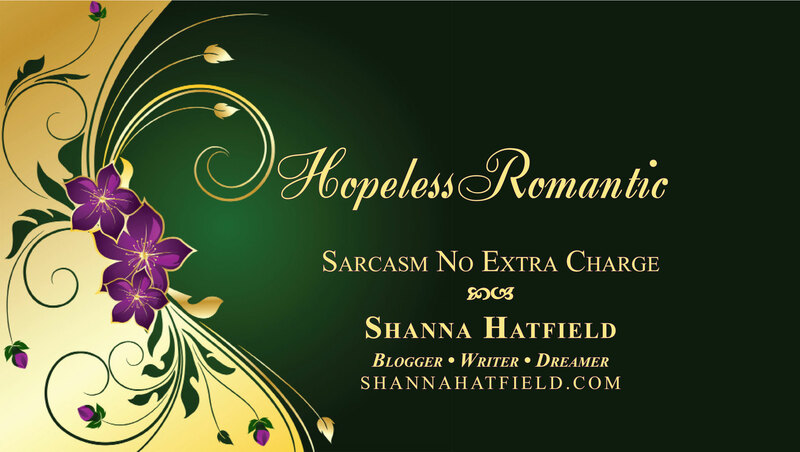 You can get all fancy and make designs… or not. I sprinkled mini chocolate chips all over the top of mine. You can add shaved chocolate, toasted coconut, drizzle it with caramel sauce. Whatever strikes your fancy. 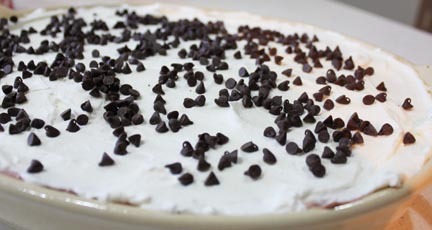 The end result is a delicious layered dessert that tastes divine and only takes about 15-20 minutes to whip up. 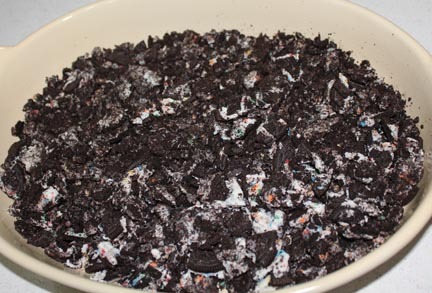 Crush cookies until cookies and filling and blended into a crumbly mass (or mess, depending on who you ask). Press into the bottom of a 9 x 13 baking dish and set aside. 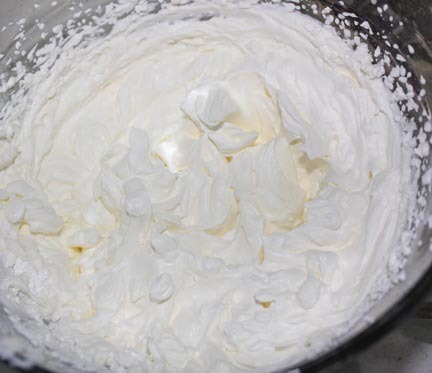 Whip cream until peaks form. I like mine sweet, so I add about 1/2 cup of powered sugar and stir in gently. 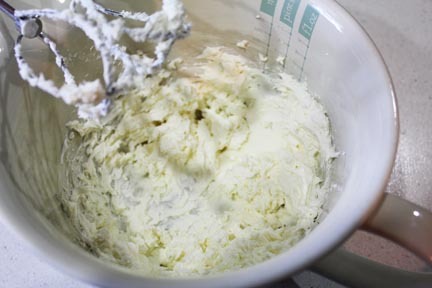 In another bowl, beat cream cheese until smooth then add in pudding mixes and milk. Beat until well blended. 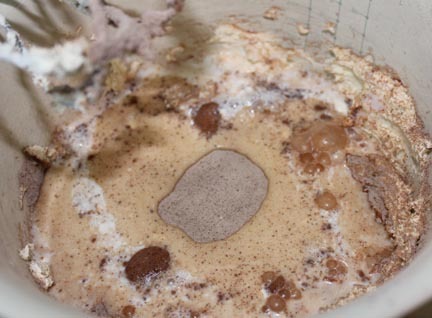 Immediately pour of the pudding mixture over the cookie crumbs in pan. 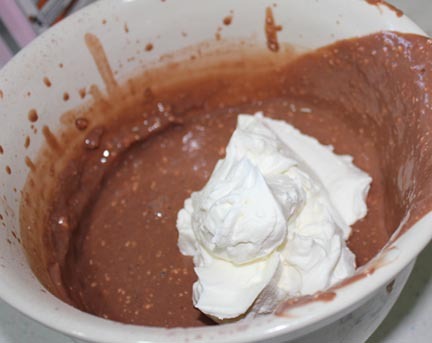 Add half whipping cream to the remaining pudding mixture and stir until blended. Spoon over top of crust and filling in pan. 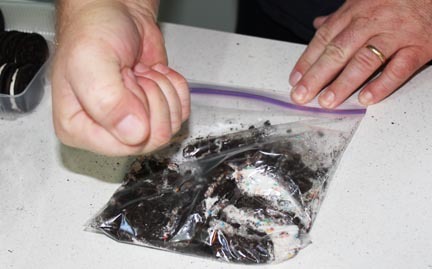 Add whatever toppings you like then cover tightly with plastic wrap and let sit over night in fridge. You can serve immediately, but it tastes so much better the next day. Keep refrigerated until ready to serve.